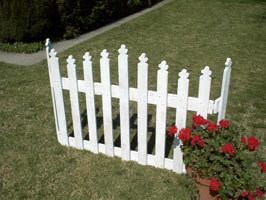 Our unique vintage styled Redwood Fence can be used for so many decorating purposes. Use it throughout the year. Use it both indoors and outdoors. Have fun and get the most out of it. During the summer use it as a decorative fireplace screen or as a patio/garden accent. During the Holidays use it as a display for other Holiday Decorations. It is great in a kids room at any time ~ section off an area with it or simply use it as a stand alone decoration. Wonderful for stimulating creativity. Available in Natural Redwood or any other solid Cottage Color and either Paint Style ~ Cottage Paint or Full Paint. Specify any Color and Paint Style if anything OTHER THAN White ~ Cottage Style Paint is desired. The Cottage Fence has 2 side fence sections that serve as a brace. These sections are hinged to the front of the fence which provide several great features. The side sections can be set at various angles (e.g. 0º, 45º or 90º to the front of the fence) to create different effects. It also makes for easier carrying and storage. Available fully assembled or in our popular Kit (Estimated assembly time is approximately ½ hour with a Phillips Head screwdriver). Made in U.S.A.